Welcome to Calpe Apartments, where you'll find information about our family owned luxury fully air conditioned apartment located in the beautiful resort of Calpe on the Costa Blanca, Spain. The apartment has three double bedrooms and can sleep up to 8 using the double sofa bed in the lounge. You can find out more about the resort and its attractions on the Calpe page, or keep up-to-date with the weather by clicking here. For links to some really useful sites we have selected try visiting the Links page. Clients receive a complimentary drinks welcome pack, consisting of tea, coffee, sugar, milk, water, beer and wine. Additional shopping can be purchased and paid for on arrival. If you are interested in making a reservation, or have a question regarding the apartment please use the Contact Us form to get in touch. Alternatively, feel free to call Mike Siddall with your enquiry on +44 (0)7907 892 665. Our apartment at Coral Beach is a luxury, beautifully furnished, air conditioned, 3 bedroom apartment situated in an ideal location with stunning views. Coral Beach is in a superb position, only 75 metres from the “EC Blue Band Q" rated beach, Playa la Fossa (the highest award on the Costa Blanca), opposite the Hotel Esmeralda, close to supermarkets, bars and restaurants. The apartment has full air-conditioning providing cool air in the summer and warm air in the winter months. The journey by car from Alicante airport (72kms) takes c.45 minutes and from Murcia and Valencia airports (135kms) takes c.80 minutes. The 4* Hotel Diamante Beach next door and 3* Hotel Roca Esmeralda opposite with superb leisure facilities open to the public including: indoor pools, gymnasiums and fitness classes – book in hotel reception. Tennis courts are available for hire at both the Turmalina and Aguamarina apartments nearby – please ask at reception. Non refundable 25% Deposit (min £150) payable on booking with balance to be paid in full 8 weeks before arrival. A security deposit of £100 is payable at the same time as the balance – this will be refunded within 30 days of return per booking conditions. Minimum occupancy is generally one week during the main holiday season although we are willing to consider shorter stays out of season. The minimum payment will be for 4 days. A supplement of £50 is payable for any stay shorter than one week. Weekly linen change only for stays of 14 days – a washing machine and tumble dryer are provided if guests wish to wash towels etc. Welcome to our guide to Calpe, with useful hints and ideas to make the most of your stay. Where is Calpe? Click here to view a map of Calpe powered by Google Earth. The immense Rock of Ifach, calm and very clean beaches or little bays and cliffs and the valleys and mountains in the inland – Calpe will surprise you with its contrasts and the mild climate all year-round. The new part of Calpe with its modern buildings and wide avenues harmonise with the ancient little fishing-village. Where tradition still has its place, tourists and visitors are always welcomed with warm hospitality. The strategic location of Calpe on the coast has attracted a lot of settlers and voyagers throughout the centuries. That is the reason why it is a town that is full of culture and history. Around the skirts of the “Peñon" were discovered remains of Iberian tribes. Later, the Romans founded a colony on the coastal plain, its main activity was dealing in dried, salted fish. During the Medieval period, the population was spread out in independent settlements. Even Christians and Moors lived peacefully together for some time, but later on the population suffered continual attacks by the pirates from the 14th to the 17th centuries. Finally abated the threat of pirates, Calpe started a period of redevelopment during the 18th century and laying the foundations in the 19th century for its current prosperity as a major attraction for international and national tourism. The local festivities start in February with the Carnival, where marching bands from the whole of Europe meet in Calpe. The “Fallas" are in March, burning ceremoniously big statues on “San Jose", the 19th. The next is a summer’s festival on the beach on the 24th June, followed by the fishermen’s patron “Virgen del Carmen" in the port the 16th July. The 5th August is the patron saint’s day of the town “Virgen de las Nieves" with processions, fireworks etc. After the German Beer Festival in October, on the 22nd of the same month is the Fiesta in honour of the “Santisimo Cristo del Sudor" and about the same time the fiestas of the Moors and Christians (www.morosicristians.com) as well with different processions fireworks, outdoor parties etc. In the old town, next to the Moorish quarter (“Arrabal") you can see a group of monuments like the “Torreo de la Peca", the ancient Town Walls and the church called “la Iglesia Vieja" the only example of Mudejar – Gothic architecture in the Land of Valencia. Along the seaside you have a modern promenade (“Paseo Maritimo") where recently have been found remains of a Roman villa, once forming part of the fish factory “Banys de la Reina". On a hill overlooking the bay you can see the hermitage of San Salvador from the 18th century. On the outskirts of the town you will find the hermitage “La Cometa and the fortified “Casa Nova", built in the same century. Near by the “Mascarat" ravine are the ruins of the Moorish castle of Calpe. All over the municipal district you can find typical “Riu-Rau" country houses beside modern villas in perfect harmony. The municipal district extends along the curved bay, where you can find the impressive “Peñon de Ifach", the Symbol of the Costa Blanca. The Rock is declared as a Nature Park and provides shelter for a variety of plants, like for example the rockrose, the germander or the Ifach campion. 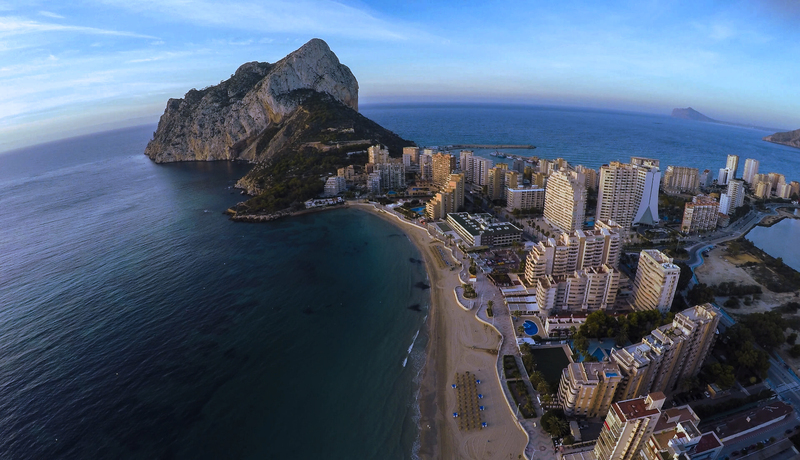 Click here to watch a video with views of Calpe. You’ve a big choice of Restaurants in and around Calpe offering everything of international cuisine and typical regional food. Some of the characteristic dishes in Calpe are its “salzones" (salty dried fish), “cruet de peix" (fisherman’s pot), “arros al forn" (oven-baked rice), “putxero de polp" (octupus in sauce) and certainly “Paella". For dessert try homemade Flan or other sweetmeats. Calpe is ideal for all kind of sea-sports. The fishing port has a Nautical Club, where you can get all information on windsurfing, sailing, water-skiing, and scuba diving. Also available are sailing courses. If you like adventures, you can find them in form of rock-climbing on the “Ifach" and “Toix" or crossing the caves in Olta. The local diving club and sailing school ensure safe conditions for both activities. La Fossa de Levante and El Arenal beaches offer a bustling contrast with a complete range of services, well cared for promenade and summer rental facilities for windsurf, pedal boats and jet- ski equipment. The activities also include the yacht club's sailing school, the diving centre at Puerto Blanco and a golf club, all overlooked by the enormous rock 332 metres high – the Peñón de Ifach nature reserve: a challenge for all rock climbing enthusiasts. With small, rocky coves and wide, fine sandy beaches, Calpe has a wide variety of attractive coastline where transparent waters are the order of the day. Its beautiful, peaceful coves include Les Basetes, to the north – a natural shelter that provides perfect conditions for learning to sail and an interesting seabed carpeted with underwater plants perfect for diving. There are plenty of golf courses within 45 mins drive of Calpe. Click here to find out more. Beautiful creek shaped by a tongue of land with the yacht club in Benissa municipality and the creek belonging to Calpe's beaches. Calm, clear waters with a bustling sailing school and a diving centre. Accessible from a steep path at the end of Avda Rosa de los Vientos. It is a quiet creek with sand, gravel and boulders where it is possible to enjoy bathing without crowds. Between the Punta de Basettes and the Penon de Ifach a wide bay is formed where this beach is located close to both apartments. With fine golden sand it has all kinds of services and on Wednesday evenings during the summer it becomes an improvised open-air cinema. Small creek with urban aspect and fine sand south of the fishing port. Close by are the Banos de la Reina, very valuable archaelogical remains. More than two kilometres of beach with fine golden sand and clear waters, splashed with small palms. It has a bustling waterfront behind which is Calpe town centre. Wide sandy and gravel inlet sheltered in its southern extreme by the northern dyke of the small Puerto Blanco port, which includes a well-known international diving centre – Espana bajo el mar. Stroll round the ancient town centre and see the typical fisherman's houses in the town's picturesque streets, then visit the Museum of Archaeology and the Fiestas Museum, the Square of “Plaza de la Villa", and finally go to the Hermitage of San Salvador on the hilltop. Take a one hour glass bottom boat trip from the port around the bay of the Playa de Levante, stopping off to view the marine life near the ocean bed. In the afternoon, wander down to the fishing port and watch the boats arrive with their daily catch. See the auctions at the Fish Market (Lonja). Enjoy local nature by travelling along the quiet rural roads running to the “Casa Nova", the “Pou Salat", the Hermitage of “La Cometa" and the “Parque de la Vallesa", or ascend the Rock of Ifach to get a splendid panoramic view of the entire area. On Saturday morning visit the bustling market in Calpe town – best to take the bus or walk as parking in town on market day in almost impossible. Trains from Calpe station go to Altea, Benidorm or Alicante to the south and Denia to the north – the bus from outside the apartment takes you to the station. The weather in summer in Calpe is typically very hot with little to no rainfall. Summer temperatures in Calpe will mostly be between 25°C to 35°C during the day. Fortunately on most days you will be most likely to have cooling sea breezes. Temperatures in the summer in Calpe rarely drop below 15°C. Because Calpe's humidity is low you won't feel the temperature is as high as it really is. Do take precautions; always wear a high sun cream factor especially if you are on Calpe's beaches. The table below displays the average temperature (both in Celsius and Fahrenheit) per month for Calpe. The table below displays the average number of hours of sun per each month for Calpe. There are lots of low-cost airlines available that fly to Alicante airport. Below are a list of links to some of their sites. We have used Neville Shelley on a number of occasions. A great way to enjoy your holiday, and entertain the kids. Keep up-to-date with the weather for your holiday using the links below. The reservation deposit is payable with the completed booking form. The full balance is payable no later than eight weeks prior to the date of arrival. In addition to the reservation deposit, a security deposit of £100 is required to cover breakages or damage to the premises or contents, cleaning costs other than normally incurred in connection with the occupation of the apartment, but not including the cleaning of upholstery etc. This deposit is refundable, subject to deductions, to cover the expenses mentioned above within 30 days of vacating the apartment. If the balance of the sum as shown on the booking form remains unpaid eight weeks prior to the arrival date, we reserve the right to cancel the booking, and in this event the deposit will be forfeited. If the client cancels after the booking is confirmed, the deposit will be forfeited. All cancellations must be confirmed in writing by the person who signed the booking form. If the client cancels within eight weeks prior to the arrival date or should the client not show for any reason, the entire amount paid will be forfeited. Unless otherwise agreed the apartment will be available for occupation from 16.00 on the first day of rental and must be vacated by 10.00am on the last day of rental. The owners shall not be obliged to offer the accommodation before the time stated and the client shall not be entitled to remain in occupation after the time stated. The client shall post the keys to the owners by Recorded Delivery within 24 hours of the end of the rental period. The client shall report to the owners' agent in Calpe (Erica Rose Property Services – 0034 699810417 – info@erpropertyservices.com) or the owner (0044 7907 892665/0044 116 2387497) without delay any defects in the apartment or breakdown of the equipment, plant, machinery or appliances in the apartment and arrangements for repair will be made as soon as possible. We the owners of the apartment accept no responsibility whatsoever for personal injury, accidents, loss or damage to persons or personal effects however caused. We accept no responsibility or liability whatsoever for any loss or damage or alteration to the terms of the booking caused by events beyond the owners control including flight delays or cancellations, adverse weather conditions, war, civil commotion, fire, flood or industrial dispute. The owners shall not be liable to the client for any temporary defect or stoppage in the supply of public services to the apartment, nor in respect of any equipment, plant, machinery or appliances in the apartment or pool area. Under no circumstances shall the owners’ liability to the client exceed the amount paid to the owner for the rental period. The owners or their agents reserve the right to enter the apartment at any time for whatever reason. Only the persons shown on the booking form are permitted to stay in the apartment. No pets are allowed. The price of renting the apartment is fully guaranteed and no surcharges will be added to the cost shown on the booking form. We, the owners and the agents do not accept liability for injury, howsoever caused as a result of the use of the swimming pools. Adults are specifically requested never to allow children unsupervised in or around the pools. All website/brochure descriptions are made in good faith and every care is taken to ensure their accuracy, but no liability will be accepted in the event of any error. This contract is governed by and shall be interpreted in accordance with English law and the parties hereto shall both submit to the jurisdiction of English courts. The client agrees to be a considerate tenant and to take good care of the apartment and to leave it in a clean and tidy condition at the end of the rental period. The owner reserves the right to surcharge the client in the event that the apartment is left in an unacceptable condition at the end of the rental period. The client also agrees not to act in any way which would cause disturbance to those residents in neighbouring apartments. Clients are strongly recommended to arrange a comprehensive travel insurance policy (including cancellation cover) and to have full cover for medical, vehicle recovery, personal possessions and public liability risks, etc. since these are not covered by the owners’ insurance. Calpe Apartments © 2018 All Rights Reserved.